LAT’s Junior Drag Oil is blended from high end base oils. 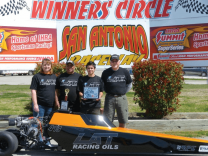 Designed to provide maximum performance and protection in the popular junior dragster class using naturally aspirated gasoline / alcohol engines. 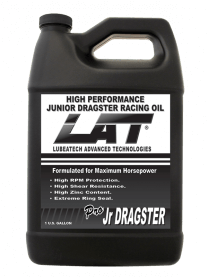 LAT’s JUNIOR DRAGSTER RACING Oils not only coats all moving parts, but is specifically designed for maximum protection of key contact points including lifter to cam, main bearings to crank, piston skirts ring and sleeves. Using high levels over 2800ppm zinc and our exclusive LFR additives promotes excellent ring seal, and minimizes blow back. LAT’s JUNIOR DRAGSTER RACING Oils added benefits include a lower viscosity, and an increase in horsepower and torque while providing serious protection for dyno tuning and high RPM engines. Available in 1 gallon, and 5 gallon pails and 55 gallon drums.